Fee: $350 plus expenses and mileage at current IRS rate. 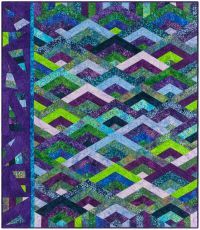 The Bodacious Trunk Show features quilts from Colleen's book and so much more! Colleen presents tips, tricks and techniques to accomplish her designs. 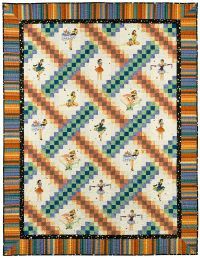 The discussion includes: Why would anyone want to be a quilter, it is such a waste of good fabric? 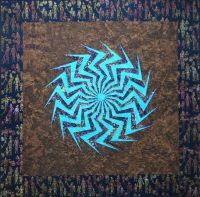 Making the transition from sewer to quilter. Needles don't have to break to be changed. How to become a long-arm quilter in less than a month. Preparing your quilt to be machine quilted. Selecting the right batting for your quilt and see the results. 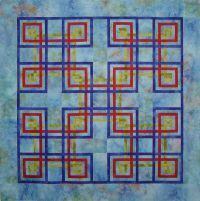 Where to find motivation for an original quilting design. There is no such thing as the Quilt Police. 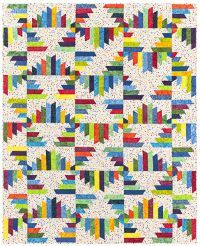 Become a detective as you create a unique mystery quilt. With each step there is another clue. Solve the: who done it; with which weapon; and at what location and you win! Everyone is a winner of sorts with their completed quilt. Prize/s will be awarded. 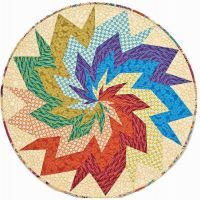 One or two day quilt projects available to meet your needs. Designs are for Beginner + students. A new twist for the traditional Carpenter's Square design, four projects to choose from, all can be started in a one-day workshop. Let each person choose the size and difficultly they can handle. The easiest is the Apprentice with only two rails, the next is the Master or Carpenter with three rails, the most challenging is the Journeyman which also has three rails but uses rectangular blocks. Projects are not suitable for directional fabrics. This is a very busy one day class and students find it more enjoyable as a two day class. 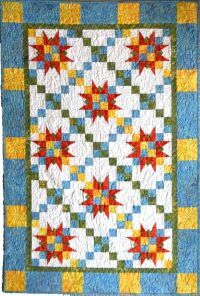 Learn each fabric folding to create three dimensional stars. The finished quilts are stunning. Choose a size to fit your desires. The Chugach Range is the northern most mountain range in the state of Alaska. 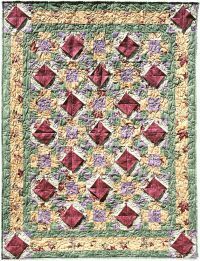 This quilt is created using one 40 - 2 1/2" strip set. Borders are extra. It can also be done scrappy. The possibilities are endless. Create your pieces then off you go to the design wall. 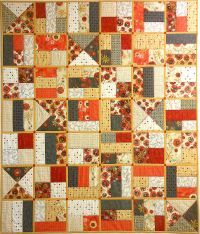 It is so much fun watching these quilts evolve. All fabric is used when you create the "drunken border." I like that no leftovers! 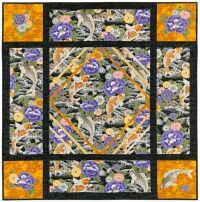 A fabulous fat quarter project that maybe quilted as it is assembled. 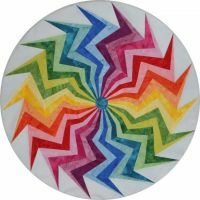 Focus is on using the lines on triangle rulers for cutting; pressing to nest seams and to achieve accuracy in matching points. 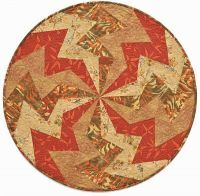 There are several options for completed projects: place mats, table runners, or a table centerpiece. 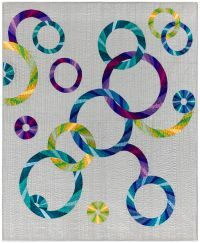 This is a comfortable one day class for all skill levels that can sew an accurate 1/4" seam. 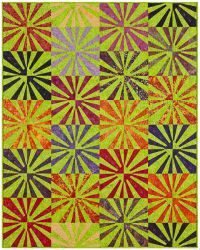 Fantabulous starts with a 10" square pack of 40 pieces. Combine those 40 pieces with 40 pieces of background fabric and let the games begin. Freezer paper templates are used to cut the fabric, no special rulers! 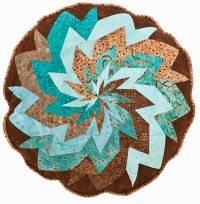 Then mix and match to create a fabulous fan type quilt. There are several layouts to try or create your own! 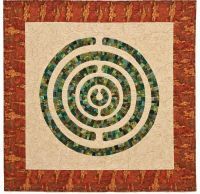 Create a stunning seven circuit labyrinth in your choice of sizes. You can start with 2", 1 1/2", or 1" strips. Accurate sewing techniques are stressed with discussions on how to use tools to be more precise. Pressing options are also discussed. Using a pressing stick to open seams helps especially with the 1" strips. Take the fear out of curved seams with the use of freezer paper templates. The freezer paper helps to hold the fabric’s shape while sewing the curved seams. The finale is how easily the optional corner sections are attached to the 28” centerpiece. This is a full day class. Check for kit availability. Watch the magic of the fabric come alive with Kaleido - Quickies. 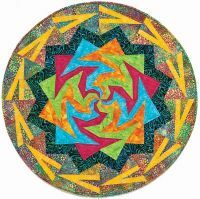 No fail kaleidoscope style quilts for all skill levels. The class will focus on layering, matching, cutting, and sewing. The book provides nine projects--each with its own unique twist and setting. It is a great one day class. 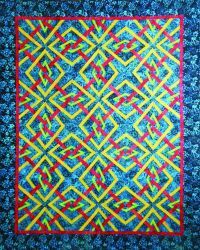 Whether you are a traditional quilter or an adventurer this quilt is for you. It starts with a 40 pack of 10" squares. Match those with 40 - 10" squares of background fabric. A paper template is included to get your angle just right, no special rulers or cutting off of points! Once your blocks are created then the fun begins! Take the blocks to your design wall/floor and let your imagination go wild. 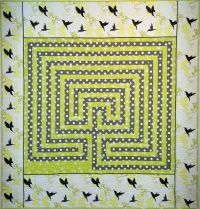 There are several layouts included in the pattern to get you started. Use your cell phone to take photos as you create! Just have fun!! 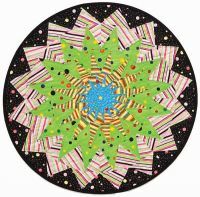 Ninja Star is a paper-pieced project that is created into sections. The sections then create rings. The rings are layered to make the final circle...NO set in seams. However there is adequate fabric available if you want to set in the seams. Choose 2, 9, or 18 fabrics to create your unique design. 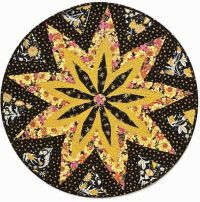 Leave the design as a circle or topstitch it onto a background to create a medallion quilt. Click on the Supply and Cutting link below to download a pdf. Learn to use a 60° triangle ruler to fussy cut motifs from large scale prints. 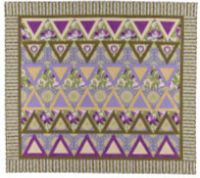 Combine those with some smaller triangles with coordinating borders. This class focuses on accurate fussing cutting and working with bias edges. 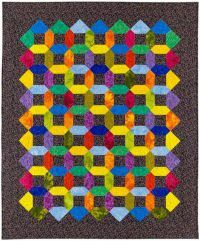 Make a lap or small twin size quilt. Good for all skill levels and a full one day class. Playing with Jax utilizes 60 degree triangles to make the “jax” design. 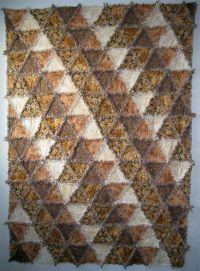 Scraps are used from the triangles to make the ball and binding. This project may look challenging, but with a few tips and techniques it is really fun and easy. Fabric folding makes the "jax" three dimensional. This class is suitable for most beginner+ skill levels. Start with a 10" square stack. Cut and re-stack and sew and press. Then repeat. This can also be a great stash buster. 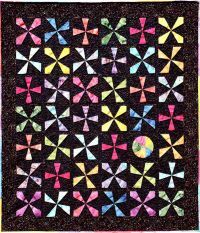 Use up all your leftover batting to quilt each block. Finally put those blocks together with sashing on both sides at the same time. When your done with the sashing the quilt is complete except for the binding. Rings of Change can be customized to your liking. Pick fabrics that you like, need 18 - fat 1/8 yards (9" x 20"). 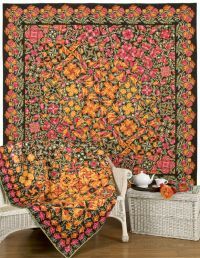 This project can also be done using a 2 1/2" strip pack (see orange quilt below). 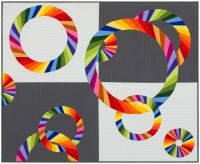 The silk quilt has 4 groupings of 7 each colorways to create the ombre effect. If this is too overwhelming there are also laser cut kits available in either American Made Brand fabrics (shown with the 4-patch background) or laser cut batik kits featuring Hoffman fabrics (shown with the black background). Pieces of the rings are cut using a template. Once the rings are constructed and pressed you get to play at the design wall. Be sure to use your phone to take pictures as you move the rings from place to place. Create a beautiful vision with a panel and a window frame that will certainly warm any room day or night. These projects use a variety of window frames to create the look desired by the student. The frame fabric is fused to the "view" fabric. Then assemble the quilt sandwich. Stain stitch around the edges of the frame to finish the edges and quilt the wall hanging all at the same time. Some people will be finished in class. Let’s go stripping with lots of colors! 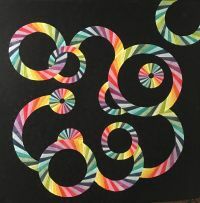 Shenanigans uses two flows of colors to make this great looking version of an Irish chain. Fussy cut squares provide for a more dramatic effect. The class focuses on accurate cutting, sewing, and pressing to nest seams for a smoother finished quilt. We will also discuss getting the most out of your fabric when fussy cutting. Four size options are available. This is a great one day class for all skill levels. 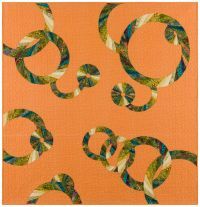 Use charm packs or fabric strips to make these fun and easy quilts. You can also cut a 10" square pack into 5" charms to easily get the quantity you need. The charms are the multi-colored blocks. Additional borders make the charms look like they are floating. There are three versions from which to choose. Letting the fabric do most of the work is the focus of this class. 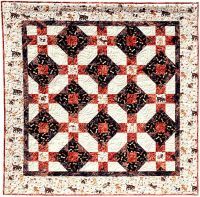 If students cut very accurately a second quilt can also be completed out of their fabrics. This class offers tons of fun in a one day class. 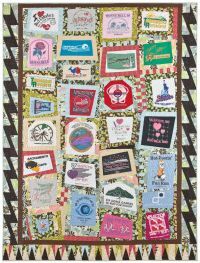 Recycle those old t-shirts and turn them into a new memory quilt. Use 12 to 30 t-shirts, don’t forget those cute little logos on the sleeves and pocket front. Combine them with some complimentary fabrics and go to town creating a new masterpiece. This class gives students permission to not be square which is very difficult for some. We will focus on how to use stretchy fabrics and allowing ourselves to just "wing it." A collage is a fun and creative way to recycle and share those old memories. Good for all skill levels. This is a very full one day class. Black, White, and Red All Over is a project that focuses on accurate cutting and pressing techniques. 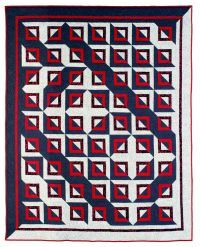 It utilizes half and quarter square triangles to set the design on point with no exposed bias edges for a smoother border. Students have the option to choose from three finished sizes. This is a good class for all skill levels. 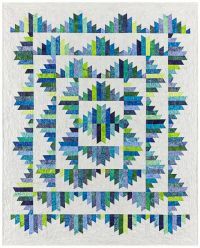 Speed up your paper piecing using the strip piecing technique. This project is sure to please the receipent, whether male or female. Think what this would look like hanging in a board room, family room, or laying across your bed. 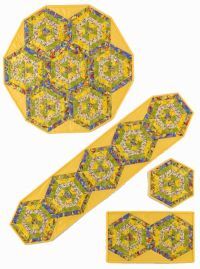 Strip paper piecing techniques are used to create this fabulous geometric design. Use subtle or high contrast fabrics for different effects. 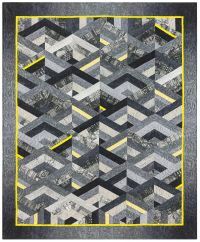 Originally designed for Asian Fabric magazine, these quilts are great projects for those large-scale "just can't cut it" prints. The key to this project is the cutting and pressing. Accuracy is vitally important especially when sewing with exposed bias edges. There are some tricks that are shared during the day. Good class for confident beginners. This is a full day class and requires large cutting surfaces be available. 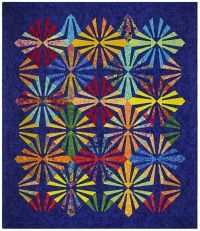 Vibrant and eye-catching round designs come from Colleen’s new book Circle Quilts. 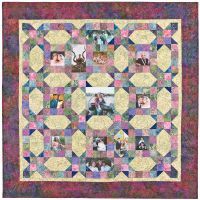 Choose from eight projects that are strip paper pieced and then finished with an invisible top stitch. These projects are sure to please whether finished round or square; made into pillows or table runners. I bring all the patterns pre-cut to class so we get the most out of the time we have. This is a full day class. This jacket uses a stack and slash technique and either fat quarters or a layer cake stack to create the fabric used. It is then combined with a crew neck sweatshirt to make this great crazy patch jacket. Hidden pockets are an option with this jacket and will be demonstrated. Recommend a two day class due to all the sewing. 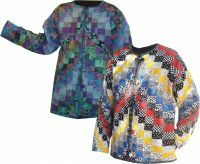 Elaine’s Bargello Jacket, the most time consuming jacket project. 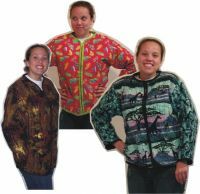 It uses strip piecing techniques, easy machine quilting, and a sweatshirt to make a stunning jacket. 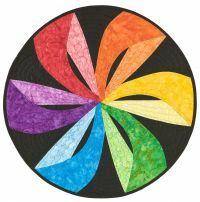 This is a good “quilt till you drop” session, a two-day class, or a retreat project. Hidden pockets are also added to this jacket. Stripper’s Delight Sweatshirt Jacket utilizes 2 ½”strips. 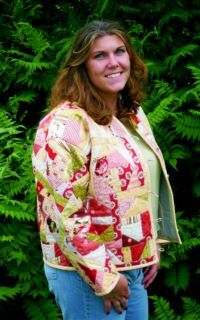 Use your stash, scraps, or a Jelly Roll/Bali Pop to make this delightful jacket. Hidden pockets are an option with this jacket and will be demonstrated. This is a very busy one day class and some groups prefer it as a two day class.